Russia continued its dominance of the global satellite launch industry in 2015, conducting 29 of 86 orbital launches over the past 12 months. It also maintained its lead in botched launches, suffering two failures and one partial failure. The United States came in second in both categories. The nation conducted 20 launches with two failures, including the loss of a SpaceX Falcon 9 rocket and a Dragon cargo ship in June. The highlight of the year was SpaceX’s return to flight in December, during which it landed a Falcon 9 first stage back at Cape Canaveral. China launched 19 times, introducing two new boosters in the process. Europe conducted eight orbital launches and a suborbital one in addition to three Russian Soyuz flights from French Guiana. India successfully launched five rockets, Japan conducted four launches, and Iran launched a satellite into orbit in February. Ukraine maintained its presence in the international launch market with two flights of its boosters from Russia. 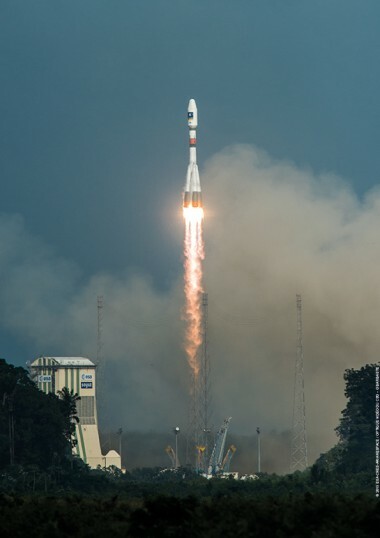 Russia launched 26 rockets from its own territory and three Soyuz boosters from the European launch complex in South America. The launches included 16 Soyuz rocket variants, eight Protons, two Rokots, one Soyuz-2.1v, one Dnepr and one Zenit 3SLBF. Nine Russian launches supported the International Space Station (ISS), including four Soyuz crew transports and five Progress supply ships. In March, a Soyuz transported NASA’s Scott Kelly and Russian cosmonaut Mikhail Kornienko to the space station for a mission set to last nearly a year. 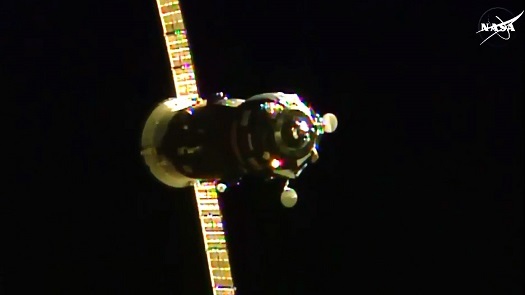 One of the Progress cargo ships didn’t make it to ISS. In April, the Progress 59P tumbled out of control after being placed into orbit by a Soyuz rocket. Russian Mission Control was unable to stabilize the ship and salvage the mission. More failures followed. In May, the Mexsat 1 satellite was lost in a Proton accident. 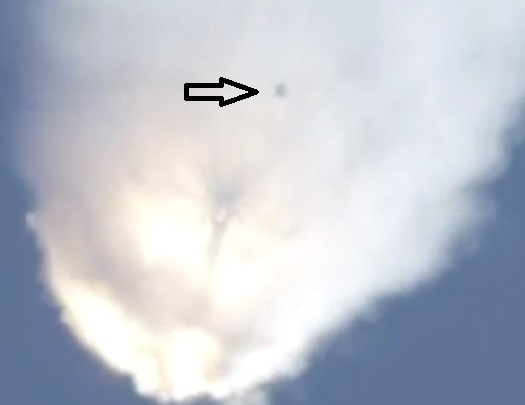 A Kanopus ST satellite burned up in the atmosphere in December after it failed to separate from the upper stage of its Soyuz 2-1.v booster. A secondary satellite was successfully deployed into orbit. The failures continued a long string of launch accidents dating back to 2009. Russia’s collaboration with Ukraine on the Dnepr launch vehicle program began to wind down in 2015. A single Dnepr rocket was launched in March; only a handful of flights remain on the manifest as Russia transitions to domestic boosters. Another joint Russian-Ukrainian program might continue despite earlier reports of its demise. The December launch of a Zenit booster was widely reported to be the last by Russia of the Soviet-era rocket, which is largely produced in Ukraine. However, an official at Sea Launch — which is owned by a subsidiary of Russia’s RSC Energia — said the company is looking to resume communications satellite launches using Zenit boosters. The company last conducted a launch in 2014. The official said the successful Zenit launch in December had renewed interest in the booster. It is also true that Energia has been attempting without success to sell off Sea Launch over the past several years. United Launch Alliance (ULA) and SpaceX accounted for all but one of the American launches in 2015. Orbital ATK’s Antares rocket remained grounded throughout the year as a result of an October 2014 accident. ULA conducted 12 successful flights, including nine Atlas Vs, two Delta IVs and one Delta II. 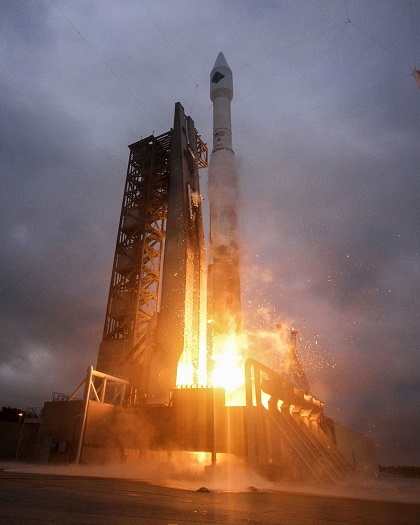 On Oct. 2, an Atlas V flew a commercial mission, placing Mexico’s Morelos 3 communications satellite into orbit. It was ULA’s 100th successful mission since the company was formed. In November, ULA returned Orbital ATK’s Cygnus freighter to flight with a successful launch to the ISS. Orbital ATK plans to launch one more Cygnus on an Atlas V in 2016 before resuming flights aboard Antares rocket later in the year. The revamped Antares will feature a new Russia-made engine in its first stage. SpaceX launched seven times with six successes. In February, a Falcon 9 booster sent the Deep Space Climate Observatory (DSCOVR) spacecraft to Lagrange point 1, a gravity neutral point in space located a million miles from Earth. 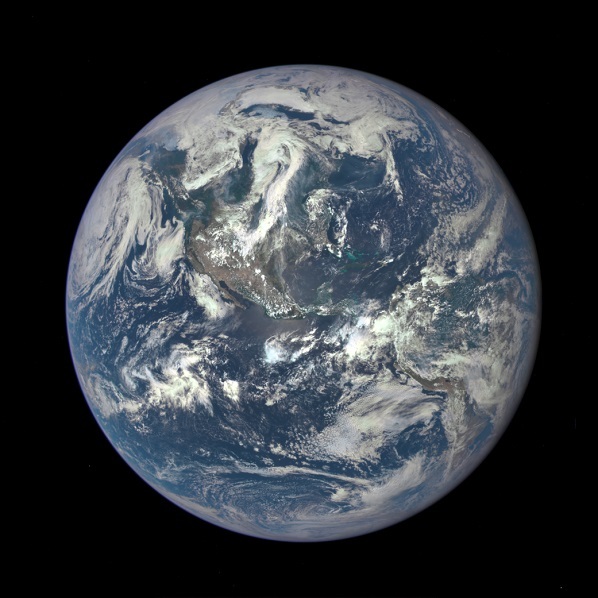 The spacecraft has returned spectacular images of Earth. 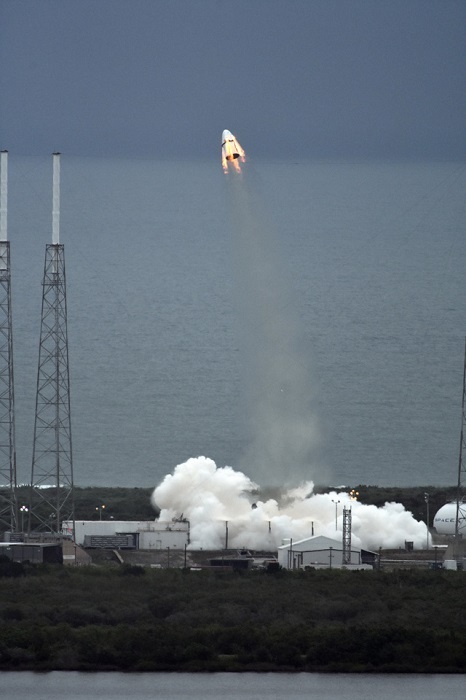 SpaceX successfully launched two Dragon resupply missions to the ISS. However, the third time was not a charm. In June, SpaceX suffered the first failure of its Falcon 9 rocket when the second stage exploded in flight, sending a Dragon plunging into the Atlantic Ocean. The Falcon 9 was grounded for six months. In late December, an upgraded SpaceX made a spectacular return to flight when it lofted 11 Orcomm OG2 satellites into orbit and landed the Falcon 9 first stage back at Cape Canaveral. SpaceX’s historic achievement came one month after Jeff Bezos’ Blue Origin successfully landed its smaller, suborbital New Shepard rocket in Texas. A reusable capsule designed to carry passengers landed separately under parachute. SpaceX continued to make progress toward launching astronauts to the space station aboard a crewed Dragon spacecraft. In May, it successfully conducted a successful pad abort test using a Dragon capsule. The United States suffered a second launch failure in November when a Super Strypi rocket loaded with CubeSats tumbled out of control after liftoff from the U.S. Navy’s Barking Sands missile range in Hawaii. It was the inaugural flight of the new small satellite launch vehicle. China launched 19 times without failure. In September, the nation debuted two new small satellite launch vehicles, Long March 6 and Long March 11. Long March 6 is a three-stage launcher capable of placing up to 1,080 kg (2,381 lb) into a sun-synchronous orbit of 700 km (435 miles). Its first-stage YF-100 engine will be used in the heavy-lift Long March 5 rocket, which is set to make its debut in 2016. The Long March 11 is a solid-fuel rocket designed for the rapid deployment of microsats. It was developed by the China Academy of Launch Vehicle Technology with the China Aerospace Science and Industry Corporation. 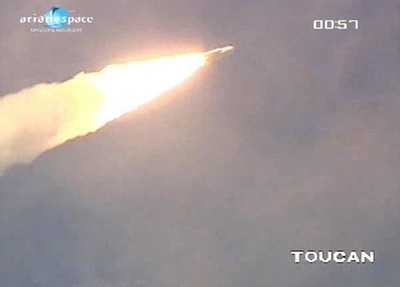 Europe conducted a record 12 launches from French Guiana, including six Ariane 5, three Vega and three Soyuz rockets. The Soyuz flights placed six Galileo navigation satellites in orbit, doubling the number of spacecraft in the European constellation to 12. In February, a Vega rocket launched the European Space Agency’s (ESA) Intermediate eXperimental Vehicle (IXV) vehicle on a suborbital flight to test re-entry technology. Vega’s three successful launches in 2015 allowed officials to declare the program’s development phase over after six flights. Vega is now being marketed for commercial flights. India launched four PSLV rockets and one GSLV Mark 2 rocket. The nation made a breakthrough in the international launch market in 2015 by placing American CubeSats into orbit. The Office of the United States Trade Representative is considering whether to further loosen restrictions on the launch of American satellites on Indian rockets. 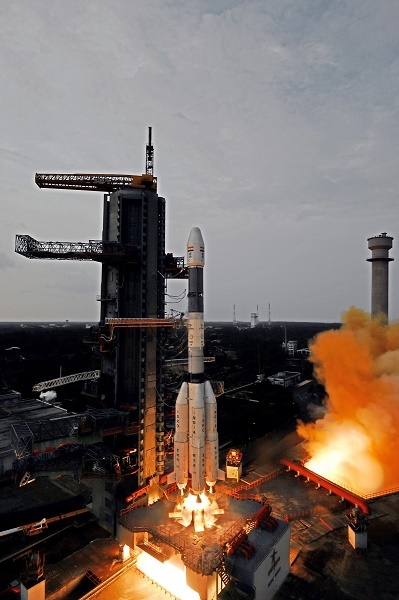 India officials were also confident enough after back-to-back successes of the GSLV Mark 2 using domestically produced cryogenic upper stages to declare the rocket’s torturous 14-year development phase complete. The rocket can now be marketed for commercial launches. ISRO plans to increase the launch rate of its two boosters to about once per month while continuing to work on the more powerful GSLV Mark 3 rocket. Japan also made a breakthrough in November when a H-2A rocket lofted the Telstar 12V commercial communications satellite into orbit. Officials are looking to market the booster commercially. Another notable Japanese launch was the August flight of the HTV cargo ship to the ISS. The successful mission helped to replenish supplies that had begun to dwindle as a result of Cygnus, Progress and Dragon failures over the previous 10 months. 66 successful launches in 2008, 73 successful launches in 2009, 70 successful launches in 2010, 78 in 2011, 72 in 2012, 77 successful launches in 2013, 88 successful launches in 2014, and, now down to 81 successful launches in 2015. But there does seem to be a gradual trend upwards. Let’s hope that trend continues. One of the US failures was a Russian engine failure. Who do we count that against? And didn’t Blue Origin have two sub-orbital launches (one with a landing)? If we’re counting sub-orbital, count those too. What US failure in 2015 had a Russian engine? Blue Origin’s launches were of a sub-orbital launcher, so they do not count. This list only includes orbital type launchers, for both orbital and sub-orbital missions. Yes it took that long for Orbital to return to flight and they haven’t yet with their own vehicle and when they do, another Russian engine, fancy that. What is it with U.S. Congress and launch companies and their continuing infatuation with Russian engines? SpaceX has returned to flight triumphantly featuring upgraded vehicle, upgraded engines, a first ever return to Earth in one piece first stage, and delivering 11 satellites to orbit. That could be a faint hope since Russia continues to suffer funding cuts to all it’s programs as well as their latest folly, centralising their industry. But perhaps that’s their only choice left. We’ll see. Large GEO comsats are the bread and butter of the launch business. Some forecasts predict a decline in those launches because constellations have been replenished and satellites last longer. However, there are several new launchers set to start flying over the next 2-3 years carrying small satellites. If even one of the proposed LEO small comsat constellations gets built, look for a surge in launch rates but possibly many of those will be small rockets. Interesting. Also, if SpaceX hadn’t had that loss of vehicle, they had a full flight manifest that could well have pushed 2015’s total over 90. Looks like Russia is recognizing they need to up their game if they wish to continue to be a factor in the space industry. THE Orbital launch used Russian engines. In 2014. Not last year. The figure also would be higher without the Russian failures. Proton in particular is a workhorse for them. Every time one of those goes down the fleet is grounded for months and everything on the manifest slides to the right. Old Rogo is rather bombastic. Talks a lot, promises much. Whether he can deliver on very much remains to be seen. Why isn’t Blue Origin’s launch and landing on the list for sub-orbital? It’s a good question. I thought about it. I could probably have added Blue’s earlier flight. The problem I ran into was if I add those flights. should I add all the other suborbital ones flown last year? I know there was one flown out of Spaceport America, and at least one from Wallops. Were there also suborbital sounding flown from Europe or Poker Flats or elsewhere? I wasn’t sure I could get an accurate count. Obviously New Shepard is a much more substantial system than the typical sounding rockets, but it’s not an orbital system. So I decided to just focus on launches of orbital rockets. For 2016, I’m going to keep a closer eye on orbital and suborbital launches so I can present a better picture at the end of the year. I really love the “XXXX in spaceflight” wikipedia pages. I use them almost as often as I use the spaceflight now launch manifest page. The 2016 in spaceflight post is already up with expected launches. Ah yea thats right. Damn has it been that long? Sigh the years go by faster and faster. No, no comrade when they fail it is the evil American pigs fault. Like that spacecraft headed to mars that malfunctioned? CIA. I think it is interesting that Space failures explosions get more media attention, than successes. I wonder if SpaceXs explosions was their best advertisement? Let’s go to the track and watch some action, Maybe there will be some wrecks today. Actually, back in 60s and 70s, some of it was CIA. Probably not. In this day and age you really can’t hide much, even when you squirrel yourself away in the middleofnowheretexas. And even then pics of busted stuff has gotten out. SpaceX is not a public company so it does not need to worry about its share price swooning every time something happens. Its investors understand that rocket science isn’t easy and kabooms happen. Consider also that launch providers are trending towards delivering multiple payloads per launch to cut costs and stay competitive (in some part due to SpaceX lowering costs). This will skew the count of launches downward. Consider the number of payloads over some mass threshold as a better count of activity. I must say that SpaceX at six launches in 2015 is a very anemic level of action. They need to triple or quadruple that count – RSN (2016?) to do what they want to *really* do -> go to Mars! The influx of cash for the likes of Google could be related to the lack of progress in picking up their rate. I like a habitation module too but who can tell what the requirements are or when it will be delivered. And if NASA or their traditional contractors build it, it’ll be another Orion. You know the Russians are not as bad as the Soviets for blaming the West for their problems. Even the Soviets were not as bad as you are saying. I read Pravda, Ezvestya on almost a daily basis between 1984 and 1991. And my local library had subscriptions to the likes of Soviet Soldier and Samalyot, Soviet Life magazines. Catch the gem of March 1985’s edition of Soviet Life as it has a great story about the Chernobyl Nuclear Power Plant and the new town of Prypyat. The Russians are a paranoid people with a victim complex and inferiority complex like you won’t believe, but they’re not as you portray. I think of them as Mexicans if Mexico had heavy industry and nuclear weapons. If you want to see the worst of Russian crazyness when it comes attributing Americans with the cause of their worst failures, I’ll suggest the Mar -> Aug 91 issues of Soviet Soldier magazine when they deal with the Battle of 73 Easting. It’s comical and sad, but so pathetic it does not rise to the levels you say they do. When you say “…another Orion”, do you mean 5-10 times more expensive than it should be?. Yep, that’s probably a reasonable figure. You could certainly use other examples but Orion was the first that came to mind. Once human cargo becomes commercial cargo and gets added into the mix plus the cargo to sustain them.. it will change the numbers. Urr,…no….Ariane 6 was created, because every customer wants to go solo and not wait for the other guy. Totally agree. In fact, I have argued that SpaceX’s launch rate is an issue. And i note that for this year, it is around 1 / month, and almost all of that is gov launches. Hopefully, before end of 2016, they will increase it to 2 / month since they will have multiple launch sites. Really? That was their main concern? If so, and there is no focus on re-use, than other than gov. and European commercial launch, they are finished. Not necessary, every country wants to protect their own capability to launch their own Sats. Europe included. And a good majority of Sat owners are European, they might come shop outside occasionally, but they have their own buy Made in Europe thing too. Technology has improved a great deal since then. Between improvements in technology and reductions in launch costs, things that weren’t economically viable back then have a better chance of success today. There’s also a change in business models to consider. Other than comsats, the standard model was to sell satellites to a customer (often government). About 10-15 years ago, companies like DigiGlobe built satellites and sold the data (imagery). Today, companies such as Spire are launching very small satellites to return other types of data (GPS radio occultation data used for space and terrestrial weather analysis). Other companies are building small satellites to return Earth observation data for a fraction of the cost of previous systems. It’s not the technology…it’s the market demand. They over predicted the demand for satellite phone calls 20 years ago…. Now, they are predicting people wants to count the cars in a Walmart parking lot in real time. All I got to say is that if the US Gov, no stranger to Big Data, is having trouble getting/finding data analyst to look through the jumble of data with their billion dollar black budget, all those data would likely go unused. kind of like all those Fitbit data that people don’t have time to look at. And you are backing up what I said. That other than gov and European commercial launch, they will be finished. What I find funny is that in the states, the MBAs are quickly pushing that it is an international thing and that we should import from other nations. Yet, when things are cheaper/better here, they still import because they control the stream. The other one, is that America appears to be the worst on importing from all over, and not so much about caring about America. Big mistake. I fully agree with Europe on ‘made in Europe’ stance. OTOH, Arianespace was able to get their prices WAY down by the use of other commercial companies that made heavy use of them. IOW, AS raided through America’s and pretty much stole it from Boeing and L-Mart. OATK was a joke that is only competing because NASA is throwing money at them. No other reason. Now, I think that with SX (and BO in the future orbital market) re-use if their prices really come down and soon, then all but china will be seeing their launch costs go up since SX will be eating 1/4 to 1/2 of other groups launches. That is huge. Keep in mind that last year, they were on track for 1 / month or 12/year prior to the event. And they were getting ready to bump it up to 1.5 / month. And that was with only 2 launch pads. This year, they have a 3rd coming on-line, and either late in the year, or early next year, they have a 4th. That SHOULD enable them to step it, though I would think that range re-config at Canaveral is a real issue.